Mediaeval myth, alchemy and magic is the theme in Great Griffin, a 5 reel, 4 row, 50 payline video slot from Microgaming. Watch as the mythical creature swoops across the reels to turn random reels wild as well as double payouts. Also on offer are a pick me feature and a trio of free spin options that awards up to 30 free spins with a 10x, 5x or 3x multiplier. Try and conjure up a big win from between 50p and £50 per spin. A mediaeval laboratory is the setting for Great Griffin – symbols on show include feathers, scales, herbs, pestle and mortar, beakers of liquid, books of spells, candles, hatching eggs, crystals and a griffin’s claw. 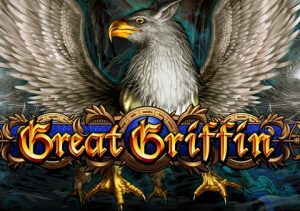 The griffin is the game’s wild, replacing all other symbols bar the 2 scatters – any winning combination that includes a wild griffin is doubled by a 2x multiplier. On any spin, an animated griffin can fly onto the screen and in the process turn a random selection of symbols into wilds – this is known as the Griffin Wild Bonus feature. Land 3 of the Lady symbol and you’ll trigger the Pick Me Bonus feature – choose 1 of the potions presented to reveal a cash bonus of up to 150 times your bet. If you’re lucky, you’ll land a pick again or better still a win all. It’s possible to re-trigger more free spins as well as hit the pick me round which helps quite a bit. You’d be hard pressed to call Great Griffin a beautiful looking game – the visuals are functional enough though and do the job. Where this slot really impresses is in the range of features – the 2x multiplier and swooping griffin keep things ticking over in the base game and the pick me and free spin rounds hit at regular intervals. The volatility in this mediaeval apothecary may not be as combustible as some would like (the variance is in the low to medium range) but the Great Griffin can still help you fly away with a decent amount of treasure if the ingredients blend nicely. If you like options when it comes to free spins, Microgaming’s Immortal Romance can’t be beaten.